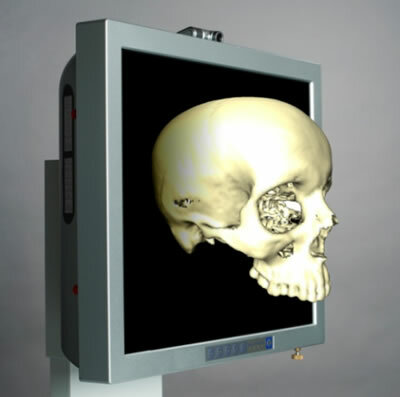 A 3D CAT scan image display with a non-contact control system allows physicians to view and manipulate medical images without touching anything. This non-contact system is perfect for use in operating rooms, where maintaining a sterile work environment is essential. The system makes use of two cameras installed above the display. These cameras look for finger movement; each sees the finger from a different angle, and software identifies its position in space. A third camera in the frame of the display scans the user's face and eyes. The display software looks at the inclination of the user's head and direction of eye focus and then generates an image appropriate for that view. This system should be commercially available in the coming year. Looking at this system, I can't help but think that this would be just the display to use with a bio-inkjet printer that could actually print out replacement parts based on what was displayed (or not seen) on the 3D CAT scan image. Learn more about these printers in the following articles, and judge for yourself. 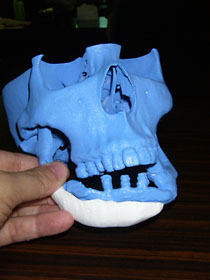 Custom-made artificial bones for implantation in humans are being printed using 3D inkjet printers. A unique ink-jet printing system using bio-ink can lay down a pattern of cells that will differentiate into a designed pattern of both bone and muscle cells.